We currently provide blades for "rapier", parry and thrust fencing, and "side sword", cut and thrust fencing. Our blades are all customizable in terms of length and stiffness. Most of our blade models may be ordered either straight or curved. The curve is measured in inches from straight at the center of the blade. If a blade with two inches of curve were held edge up on a table with the point and shoulder of the tang touching the table top, then the back of the blade at its highest would be two inches above the table. For more detailed information see the descriptions of the individual blades below. Our blades are available with either round rod, rectangular rod, or flat tangs depending on the model. Round rod tangs come in a diameter of 5/16" and are threaded 6x1 metric. Rectangular rod tangs are 5/32" thick and 1/2" wide for most of their length, and are threaded 6x1 metric. Our products have a number of advantages over other commercial blades. Due to a unique double taper design our product is neither too stiff nor too whippy, providing a blade which is light enough at the tip for flexibility but with enough increasing stiffness to provide a good forte. Additionally all variants are made with a racetrack cross section to greatly extend blade life. Such a rounded edge is far more difficult to nick and simultaneously reduces damage to an opponents equipment. For information regarding the stiffness of blades click on the following link to the blade testing page. These blades are manufactured in a range of widths and lengths. Lengths may be from 27 inches up to the full 40 inches. We now also offer a long sword and great sword version of our flat tang blades. The long sword blades are available in lengths from 38 to 42 inches and the great sword blades in lengths from 44 to 52 inches. 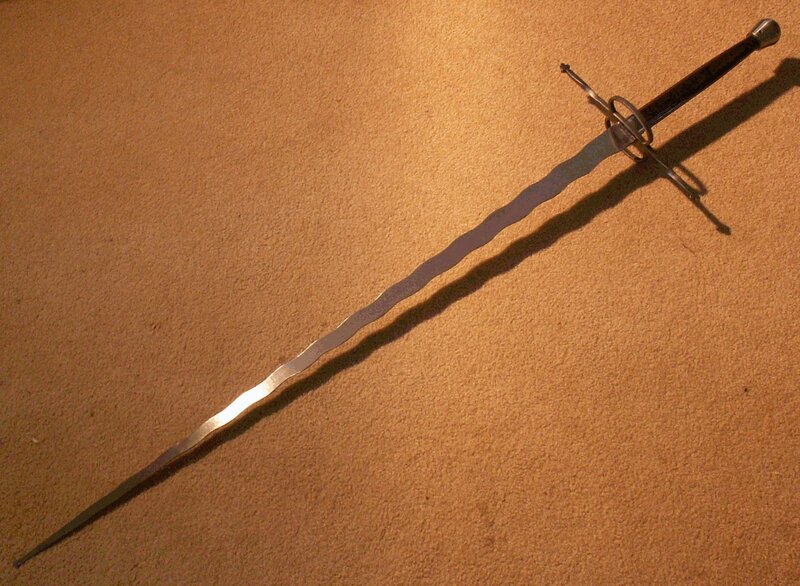 Long sword blades have tangs up to 12 inches, and great sword blades have tangs up to 20 inches. These have 1 1/4 inch wide tangs. Flat tang blades may be ordered curved. Our Alchem blades have a maximum flex force of from 18 to 25 pounds and a flex force of from 10 to 12 pounds. If you require a specific maximum or minimum stiffness, please remember to specify this when ordering. If not specified we shall ship a blade of average stiffness. Our long blades, hilted or unhilted, are shipped with a rubber bird blunt. Additional blunts may be ordered separately. The blade illustrated above in the left photo on the left is our flat tang model. These have a width of from 1 1/8 inches to 1 3/4 inches at the shoulder, depending on the overall length, and a constant taper to the button of the tip which has a width of approximately 3/8 inches. Our flat tang blades have a length up to to 43 inches. Blades under 40 inches in length have a 1 inch wide tang, narrowing to 7/8 inches at the pommel end. The blade illustrated above in the right photo is an example of the flamberge version of our long sword blade. Our long sword and great sword blades have a 1 1/4 inch wide tang, narrowing to 7/8 inches at the pommel end. Long sword blades and great sword blades are not interchangeable without some hilt modification. Great sword tangs are 1/32 inch thicker than our standard flat tang blades for added stiffness. Also, please note: Our flat tanged blades require a custom pinned pommel which may be ordered separately. Additionally, flat tang blades may be ordered slightly curved at no extra charge. This slight curve is only cosmetic and provides the user with no real advantage. A greater amount of curve may be added for an extra charge of $10. For a customer review and close up photos of this blade type follow this link. When ordering, be sure to specify the desired blade length, and whether you want it curved. PayPal provides a buyer comment to seller option. The default if not specified is 36 inches and straight. We currently produce only the schlager/rapier vesion of our Safeflex blades. The original broadsword version has been discontinued. These are a scaled up thicker version of our popular dagger blades. For four examples of these, see the photo to the right. The left most is the narrow schlager/rapier pattern which has a maximum blade width of one inch at the shoulder. Second from the left is our discontinued colichemarde pattern. The two right most blades are the discontinued broadsword pattern in a straight and curved version. Safeflex long blades are approximately 1 inch wide at the shoulder of the tang and taper to approximately 3/8 inch at the tip button. 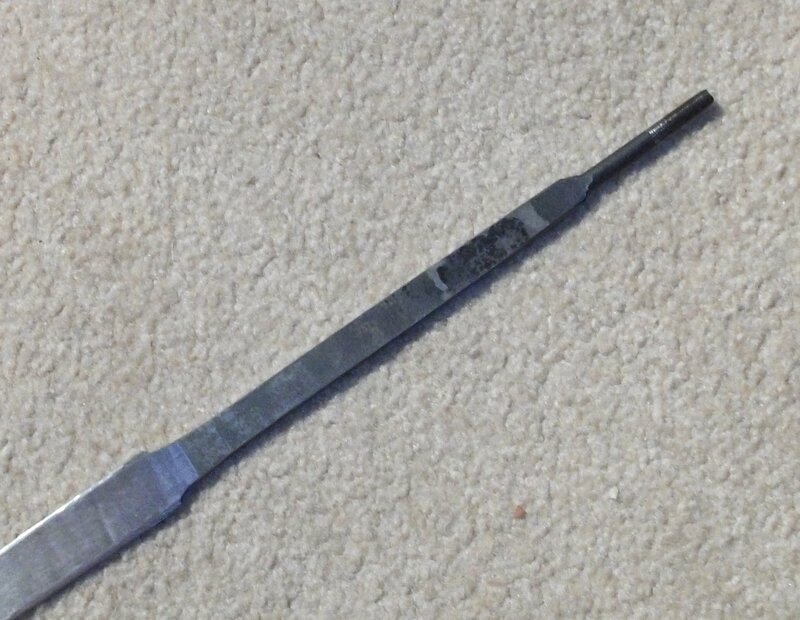 The 7 1/2 inch long overall tang consists of a 5/16 by 1/2 inch rounded shoulder tapering over 1 inch down to a 5/16 inch diameter by 4 1/2 inch long rod, and a 7/32 inch diameter by 2 inch long end threaded 6x1 metric. The schlager/rapier blade can be ordered finished in a blade length from 24 inches up to the full 40 inches. Additionally, they may be ordered slightly curved at no extra charge. This slight curve is only cosmetic and provides the user with no real advantage. A greater amount of curve may be added for an extra charge of $10. Our blades, hilted or unhilted, are shipped with a rubber bird blunt. Additional blunts may be ordered separately. When ordering a Safeflex blade, be sure to specify the desired blade length and whether you want it straight or slightly curved. PayPal provides a buyer comment to seller option. The default if not specified is 36 inches and straight. These are our original long blades, and are manufactured with a 3/4 to 7/8 inch shoulder width tapering to a blunted button tip with a width of approximately 5/16 inch. Lengths, not including the tang, may be from 32 inches up to the full 43 inches. The up to 43 inch blade rod tang blades may be ordered curved. In addition to the original schlager rapier blades we are now manufacturing a slightly more expensive version with blade lengths from 43 to 48 inches. Our Alchem blades have a maximum flex force of from 18 to 25 pounds and a flex force of from 10 to 12 pounds. If you require a specific maximum or minimum stiffness, please remember to specify this when ordering. If not specified we shall ship a blade of average stiffness. Our long blades, hilted or unhilted, are shipped with a rubber bird blunt when not ordered in bulk. Additional blunts may be ordered separately. On the left is a photo of the tang end of a typical rectangular rod tang blade. Tangs are 5/32 inch thick. These are 5/8+ inch wide at the shoulder and narrow rapidly to 1/2 inch for most of their length. They narrow to a round rod threaded 6x1 metric for approximately 1 1/2 inches. This gives an overall tang length of up to 7 1/2 inches. The threaded round rod end has a diameter of 7/32 of an inch and is approximately 2 inches long. Also, please note: Our rectangular rod tanged blades require a custom grip which may be ordered separately at a price of $20 each. We have added a shopping cart button below by which you can order wooden grips cut to whatever length you require. The tangs on the current blades are wider for more of their length than on the originals. Therefore, if you are replacing an Alchem rod tang blade purchased prior to 2012, you may have to use one of our Safeflex broadsword or Safeflex schlager rapier blades in certain of our hilts. The Safeflex models are all made with a 5/16" diameter round rod which will fit in our older hilts. If you wish to use one of the new blades, in an old hilt, please e-mail us with the hilt type you are using and we'll let you know if the new model blade will fit. The 1 1/2 inch threaded section can be shortened down to approximately 1/2 inch giving a 6 1/2 inch tang with 1/2 of threading. If you require a shorter tang, we can provide them in shorter lengths with 1 1/2 inch threaded. Please be sure to specify this at the time you order. Additionally, rod tang blades may be ordered slightly curved at no extra charge. This slight curve is only cosmetic and provides the user with no real advantage. A greater amount of curve may be added for an extra charge of $10. Non US customers should contact us prior to placing orders and we'll estimate shipping. Non US customers should contact us prior to placing bulk orders and we'll estimate shipping. Once your order has shipped, any overpayment will be refunded. For bulk quantities greater than 25 units, all customers should contact us for pricing and bulk shipping and we'll provide a quote. When ordering, be sure to specify the desired blade length, and whether you want it curved. Also, if you require a shorter tang, specify that as well. PayPal provides a buyer comment to seller option. The default if not specified is 36 inches and straight with a 7 1/2 inch tang of which 1 1/2 inches are threaded. If you order a grip, be sure to specify its length and finish. The default is unstained. These are a lighter version of our original long blades, and are manufactured with a 1 inch (schlager rapier model) to 1 1/4 inch (broadsword model) shoulder width tapering to a blunted button tip with a width of approximately 5/16 inch. Lengths, not including the tang, may be from 32 inches up to 37 inches for the wider broadsword model and 38 inches for the narrower schlager rapier model. Our Alchem blades have a maximum flex force of from 18 to 25 pounds and a flex force of from 10 to 12 pounds. If you require a specific maximum or minimum stiffness, please remember to specify this when ordering. If not specified we shall ship a blade of average stiffness. Our long blades, hilted or unhilted, are shipped with a rubber bird blunt when not ordered in bulk. Additional blunts may be ordered separately. On the left is a photo of the tang end of a typical rectangular rod tang light blade. Tangs are 1/8 inch thick. These are 5/8 inch wide at the shoulder and narrow rapidly to 1/2 inch for most of their length. They narrow to a round rod threaded 6x1 metric for approximately 1 1/2 inches. This gives an overall default tang length of up to 6 1/2 inches. Tangs may have lengths of up to 7 1/2 inches with a shoulder width of 3/4 inch. The threaded round rod end has a diameter of 7/32 of an inch and is approximately 2 inches long. Also, please note: Our rectangular rod tanged blades require a custom grip which may be ordered separately at a price of $20 each. We have added a shopping cart button below by which you can order wooden grips cut to whatever length you require. The tangs on the current blades are wider for more of their length than on the originals. Therefore, if you are replacing an Alchem rod tang blade purchased prior to 2012, you may have to use one of our Safeflex broadsword or Safeflex schlager rapier blades in certain of our hilts. The Safeflex models are all made with a 5/16" diameter round rod which will fit in our older hilts. If you wish to use one of the new blades, in an old hilt, please e-mail us with the hilt type you are using and we'll let you know if the new model blade will fit. The 1 1/2 inch threaded section can be shortened down to approximately 1/2 inch giving a 6 inch tang with 1/2 of threading. If you require a shorter tang, we can provide them in shorter lengths with 1 1/2 inch threaded. Please be sure to specify this at the time you order. Additionally, rod tang blades may be ordered slightly curved at no extra charge. This slight curve is only cosmetic and provides the user with no real advantage. When ordering, be sure to specify the desired blade length, and whether you want it curved. Also, if you require a specific tang length, including threading, specify that as well. PayPal provides a buyer comment to seller option. The default if not specified is 36 inches and straight with a 6 1/2 inch tang of which 1 1/2 inches are threaded. If you order a grip, be sure to specify its length and finish. The default is unstained.